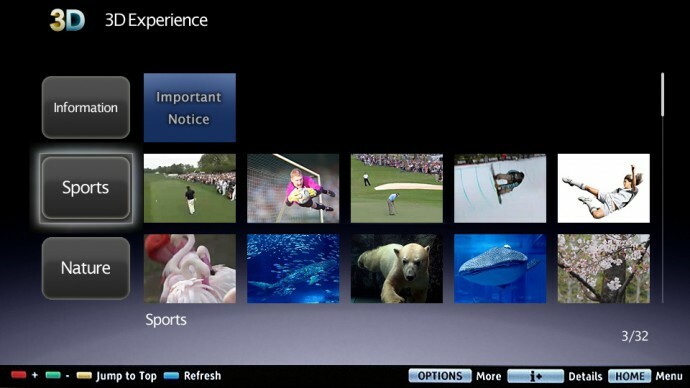 Sony’s “3D Experience” is a new and free of charge on-demand streaming service offering a range of promotional video clips and trial content in 3D format for owners of compatible Sony Bravia 3D HDTVs. The service should be available starting today (July 13th) on all compatible 3D HDTVs from Sony without the need of registration, and initially it will be available only in the following five countries: UK, Germany, France, USA and Canada. According to Sony, the “3D Experience” service will provide instant access to an extensive range of 3D clips and trial content from a wide variety of genres, including movies, music, sports, and documentaries, with about 30 titles expected to be available at launch. In order to be able to comfortably watch the 3D content it is recommended to have an internet connection with a speed of at least 10Mbps. Sony plans to further expand the content line-up and promote their “3D Experience” service among other content providers as a platform through which they can showcase their 3D products, so that not only 3D content being produced by Sony will be available in the future. Of course this free service won’t be offering full-length movies in 3D format, it is just intended as a showcase where you will be able to watch short promotional videos in 3D format and if interested in a specific movie, then you would still have to go and buy it on Blu-ray 3D media for example. But who knows, maybe if the service turns out successful among the users Sony could expand it further and start offering paid content as well. with Sony TV’s who it won’t work with. I don’t see the 3 d option on my 3d Sony. where do you find it ? and have downloaded the 3d Experience App to it? When is this service going to be available in other countries??? I’m using an XBR 46 inch. The 3-D experience menu loads however none of the videos seem to load. A few months ago when I last tried it it worked well. Is the Sony server down every now and then? Also, I find instability when using iPhone remote or streaming from computer. Sometimes the TV sees it and sometimes it doesn’t. My 15MB wireless is more than enough. Does Sony need to provide better software maybe?